TIME FOR WAR (AUS) (Bay 2011-Stud 2015). 3 wins at 2, A$470,950, ATC Pago Pago S., Gr.2, BRC Sires' Produce S., Gr.2, ATC CFMEU Mining & Energy 2YO P., 2d Gold Coast Guineas, Gr.3, ATC Brian Crowley S., L, SCTC Glasshouse H., L, 4th ATC Sires' Produce S., Gr.1. Grandson of SW Miss Power Bird, a half-sister to SW Lucky Owners (Hong Kong Mile, Gr.1). Related to SW Mosheen (ATC Randwick Guineas., Gr.1), etc. His oldest progeny are 2YOs. EMERALD DOWNS, by Churchill Downs. 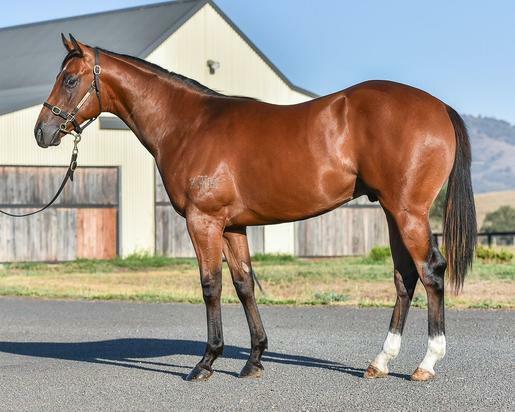 2 wins-1 at 2-at 1100m, 1200m, A$208,618, MVRC Electrical Trades Union 2YO H., ATC Keune H., 2d MRC (Mornington) Inglis Premier 2YO S., MVRC Hacer Group Premium P., ATC Big Brown First Crop H., 3d ATC Cloudy Bay H., Australian Turf Club H., 4th MVRC Champagne S., Gr.3. Half-sister to TURFFONTEIN, Royal Missile, Lady Gracious (dam of AFFABLE), Graces Spirit (dam of VALIANT SPIRIT - BEAUTY SPIRIT (H.K. ), VERGARA). This is her first foal. TURFFONTEIN (Johannesburg). 5 wins-1 at 2-from 1200m to 1600m, A$1,271,250, MRC Sir Rupert Clarke S., Gr.1, MVRC William Reid S., Gr.1, Queensland Guineas, Gr.2, MRC Wellington Racing Club S., L, STC Gaypak Mandarins 2YO H., 2d VRC Patinack Classic, Gr.1, MRC Caulfield Sprint H., Gr.2, VRC Seppelt Salinger S., Gr.2, AJC South Pacific Classic, Gr.3, MRC Moonga S., Gr.3, Hawkesbury Guineas, L, STC De Bortoli Wines 2YO H., 3d BTC Doomben Ten Thousand S., Gr.1, MRC Sir Rupert Clarke S., Gr.1, STC Hobartville S., Gr.2, Run to the Rose H., Gr.3, QTC Charmosa 2YO H., 4th VRC AAMI Travel Insurance S., Gr.3, MRC Heath S., L. Sire. Royal Missile (Smart Missile). 5 wins to 1400m, A$284,500, to 2017-18, WATC Kirin Megumi P., Hosemasters P., Pinjarra RC Pearl Classic H., WATC Tabtouch H., Glenroy Chaff H., 2d WATC Cyril Flower H., L, Amelia Park P., David Grays Aglink H., Belmont Bonanza 2YO P., 3d WATC Marjorie Charleson Classic P., WA Bookmakers Association H., 4th Bunbury S., L.
Muraqaba. 4 wins from 1300m to 1900m, A$133,955, to 2016-17, ATC Schweppes H., Hyland Race Colours H., 2d ATC Tab.com.au H.
Emerald Downs. 2 wins. See above. AFFABLE (Husson). 2 wins at 2, A$95,175, VRC Gibson Carmichael S., L, 2d MRC Routley's 2YO H., 3d MRC Hyland Race Colours 2YO H.
Gracious Prospect (Tale of the Cat). 5 wins to 1450m, A$473,795, VRC Lawn H., Primacy H., Flemington H., 2d Bendigo Guineas, L, MVRC St Albans S., L, ATC Blackwoods Alemlube 2YO H., MRC Routley's 2YO H., Changing Places Real Estate H., 3d MRC Kevin Heffernan S., Gr.3, VRC TAB Rewards S., Gr.3, ATC Fernhill H., L, SAJC HC Nitschke S., L, VRC March S., L, Ballarat TC Magic Millions Clockwise 2YO Classic, 4th ATC Schweppervescence H., Gr.3, TTC Gold Sovereign S., L.
VALIANT SPIRIT - BEAUTY SPIRIT (H.K.) (Duporth). 3 wins from 1450m to 2000m, A$186,165, in 2017-18, MRC Autumn Classic, Gr.2, 2d MVRC Quest Moonee Valley H.
VERGARA (Snippetson). 8 wins from 1200m to 1900m, A$530,095, ATC Epona S., Gr.3, Wyong RC Mona Lisa S., L, ATC Schweppes H., TAB Place Multi H., 2d ATC Cellarbrations H., TAB Quaddie H., 3d ATC Civic S., L, 4th ATC Doncaster H., Gr.1, Golden Pendant, Gr.2, Guy Walter S., Gr.2, Triscay S., Gr.3. Bails (Vettori). 8 wins from 1200m to 1600m, NZ$9,087, A$172,150, QTC Treasury Casino Welter H., GCTC Macau Jockey Club H., QTC St Margaret's OGA H., Don McDougall H., Yuletide H., Planet Ruler Welter H., WRC Hartner Construction H., 2d Gold Coast S., L, QTC Ascot H., L, 3d QTC Reckless H., L.
Broadband (Langfuhr). 5 wins-1 at 2-to 1400m, A$176,500, MRC Woorak H., VRC Fiesta Star Welter H., MRC Lady Jakeo H., Marmion H., VRC Allan Jeans 2YO H., 2d MRC Jack Elliot H., Ashleys Foresters Arms Hotel H., 3d MRC Vain S., L, 4th VRC Standish H., Gr.3, MRC Christmas S., L.